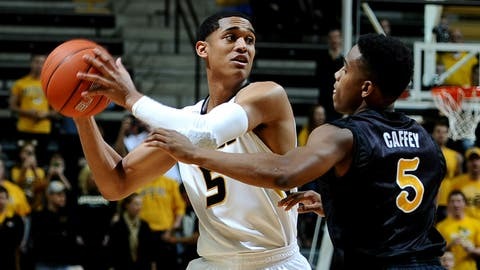 Jordan Clarkson, who leads the SEC with a 20-point average, had a season-low 11 points in the Tigers' win Saturday. COLUMBIA, Mo. — Jabari Brown had one of his best overall offensive games. No. 25 Missouri’s defense stepped up, too. Brown scored 22 points in 39 minutes and hit a key 3-pointer late in a 69-59 victory over pesky Long Beach State on Saturday. The 49ers shot just 27 percent and were outrebounded 24-11 in the second half. "I’m from the West Coast, so I know Long Beach State has a good team every year," Brown said. "Their record isn’t the greatest, but they’ve played pretty much everybody on the road." Earnest Ross added 16 points and Ryan Rosburg had a career-high 11 rebounds for the Tigers (12-1), who open Southeastern Conference play at home against Georgia on Wednesday. Jordan Clarkson, who leads the SEC with a 20-point average, had a season-low 11 points. "I feel like we are in a good position," Brown said. "We’ve been through a lot of close games, we’ve had some good games like this one here." Noting the lone loss was by a point to Illinois in St. Louis, coach Frank Haith said the Tigers were ready for the SEC. "We’re two free throws from being 13-0, so I think we’re in pretty good shape," Haith said. "I like where we’re at." Missouri has won 26 in a row at home, the longest current streak in the nation. It also has an 81-game winning streak against nonconference opponents since losing to Sam Houston State to start the 2005-06 season. Long Beach State (4-10) cut the deficit to two points with just under six minutes remaining, but Missouri outscored the 49ers 12-4 the rest of the way. "We were right there all the way until the end," said Tyler Lamb, who led Long Beach State with 17 points on 4-for-13 shooting. "I think we could have won this game easily. "I think this game just shows us our identity and how good we can be if we play a whole game instead of just the first 10 minutes or the first half." The game was up for grabs before Brown’s 3-pointer made it 64-57 with 2:18 to go. "I think we started off sluggish," Rosburg said. "I think we turned it on when we needed to." Dan Jennings, Long Beach State’s leading rebounder, missed the last 16 minutes after banging heads with Caffey under the basket and going down awkwardly. Jennings favored his left leg walking off the court and also was being evaluated for a head injury. "I’ve heard it was his head, then I heard it was his ankle," 49ers coach Dan Monson said. "I’m not sure. I think they’re checking several things." Long Beach State won the Big West last season and had won three in a row since Lamb, a UCLA transfer, became eligible. Haith warned players this was no typical four-win team. "I think they’ll contend for their league championship," Haith said. "I think this is a great, great win for us." The Mizzou Arena was about half full, with attendance announced at 8,679 a day after the Tigers’ ninth-ranked football team beat Oklahoma State in the Cotton Bowl. The entertainment was a skeleton crew of five cheerleaders, an alumni band and no Golden Girls. Haith said he hadn’t noticed, but took the opportunity to poke fun at coach Gary Pinkel’s dance moves in the locker room. "I did like our football game," Haith said. "I liked Gary’s dance, too, by the way. I do need to spend some time with him working on some of that stuff for next season." Wes Clark’s 3-pointer gave Missouri its largest lead at 51-38 with 13:32 to play. Long Beach answered with a 10-2 run, with Lamb scoring five of the points. Four straight points by Gulley cut the deficit to 57-55 with just over six minutes to go. Missouri shot 58 percent in the first half and rallied from eight points down to take a 37-34 lead. Long Beach had an 18-13 rebounding advantage, plus the Tigers hurt themselves by missing six of their first 11 free throws. "We started off terribly on the glass," Rosburg said. "It was just a team effort trying to box out."